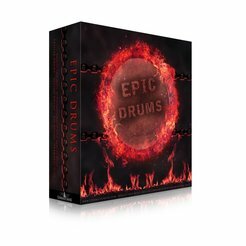 Epic and dramatic, as massive as possible - Epic Drums! With these 10 high adrenaline, aggressive and dramatic drum tracks, you'll be able to cover all of your needs for chase and action scenes or even to combine few of those and to make your projects epic trailer. With this pack only imagination is your limit. Download this album (every track on this page) for $10 and support our work. Epic and dramatic, as massive as possible - the core idea of this pack. With these 5 tracks, you'll be able to cover all of your needs for chase and action scenes or even to combine few of those and to make your projects epic trailer. With this pack only imagination is your limit. Same as a previous pack, adrenaline and fast paced action drums are awaiting for you in here! ​The only slightly change might be in their sound, everything else, full and epic as it should be. 10 extremely loud and epic drum hits suitable for any project enviroment wether you want to use it as a video game menu sound, treasure discovery sound, to finish your projects trailer music, only imagination is your limit! Each hit is made of different drums (sometimes similar) which will give your project each time different vibe and big, epic sound effect. As previous pack, this one is featuring bombastic and dramatic drum hits. ​Only the sky is your limit with this one! Copyright 2019 - Orchestralis - Powered by Dual Horns Studio Ltd.